A Missing Word: Does It Obscure Shared-Church Prayer? Although Webster estimates English includes a million words, our language still lacks one. Might that missing term make it more difficult for us to see the need for and to practice shared-church prayer? That question came to mind during a study on prayer with our adult Sunday school class. Our text: Eph. 6:11-18, the well-known verses that urge us to put on the full armor of God and to pray. As I was exploring the passage on my own, I noticed a consistent pattern. In the NIV, each you (four times) and your (three times) translates the corresponding Greek plural—which disappears in today’s English. We use the same word, you or your, whether speaking to one person or a hundred. The mostly southern you-all is the closest we can come in English to a second-person-plural word. Otherwise, the plural you takes multiple words, as in all of you. It's true, of course, that we should take this Ephesians passage to heart as individuals. The body of Christ is made up of individual members. But Paul’s repeated use of the plural you suggests that he means not only solo but also corporate action—armoring up and praying together. It seems, though, that individualism has gained the upper hand not only in our culture but also in our churches. Something right may go wrong if it becomes an “-ism.” Watch out when community becomes communism. Everyone needs a mom, but not momism—unhealthy attachment to mother. You can learn much from the teachings of Calvin or Arminius, but stiff commitment to Calvin­ism or Arminianism can divide. Scripture guards our places as individuals, but it does not endorse individualism. Individualism works against our learning to pray. How did you, as an individual, learn how to talk? Not all alone. You probably did so as one member of a family. As you listened to and interacted with others, your own spoken vocabulary developed. How do we, as individuals, learn how to pray? Again—not all by ourselves, but as members of the corporate body of Christ. Hearing other Christians pray helps us to develop our own ability to pray. But the missing English word, the plural you, can make that hard to see. Some Christians, on the basis of what Jesus said about praying in our closets, insist that shared praying—praying together—is wrong. But there Jesus was surely speaking against praying to show off, against putting our prayers on parade. If he had forbidden them to pray with others, why did his disciples do so? “They all joined together constantly in prayer, along with the women and Mary the mother of Jesus, and with his brothers” (Acts 1:14). Eph. 6:11-18, full of the plural Greek words for you, links wearing God’s armor with prayer. A complete set of that protective gear includes the shield of faith. Jesus called for faith to accompany effective prayer: “If you believe, you will receive whatever you ask for in prayer" (Matt. 21:22). And James speaks of the “prayer offered in faith” (5:15). How does the plural you relate to the shield of faith and prayer? 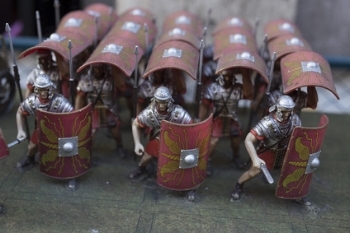 As one who spent a fair amount of time around Roman soldiers, Paul probably had the scutum in mind. This door-sized shield allowed the soldier to protect his entire body. He could wield it individually. But he could also use it when fighting alongside fellow soldiers as a group. In “phalanx” formation, he and others would align their shields side-by-side to form a virtual wall against the enemy. By lifting their shields overhead, they created a roof over themselves when flaming arrows rained down from above. When we—together—pray with our united faith-shield, we present a more formidable spiritual “wall” or “roof” to the forces hell-bent on destroying us. Can we practice this united faith-praying during our Sunday meetings? 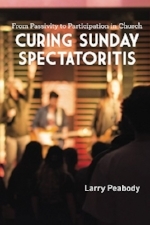 In my book, Curing Sunday Spectatoritis, I include this account from the Peniel Wesleyan Tabernacle in Greater Georgetown, Guyana. The time set aside for praying for one another in this church . . . began when in 2011 it struck, Michael Suffrienin, the pastor, that he could not be there to pray for everyone. He knew the church body included many struggling and immature believers. But he also knew of many stronger Christians who could influence and help them. So one Sunday, during the worship service, he simply asked for a pause in which he shared a brief Bible passage relating to prayer. Then, after identifying a particular issue the church was facing at that time, he asked people to find a partner and join together in prayer for that concern. When the church had grown accustomed to partnering in prayer during their main weekly gathering, he expanded the scope of prayer subjects by asking anyone with a need for prayer to share that with someone else and then pray for each other. These sessions of one-another prayer have included such concerns as family challenges, financial worries, loss of loved ones, and recovery after theft or flood damage. Although this prayer time is not a part of every meeting, when included it typically takes 10 to 15 minutes. I have just returned from a three-day men’s retreat. On the final day, we noticed that one of the guys began receiving a flurry of texts on his phone. Soon we learned that his father, thousands of miles away, had only hours to live. We circled around him and formed a phalanx of faith-based prayer. His tears flowed freely as each of us, in turn, prayed for him and his family. Shared-church prayer should take place no matter what the size of our gathering. We can pray together in twos (Matt. 18:19-20), in our small groups (Acts 13:3), and in our larger gatherings (Acts 1:14-15). Even without knowing Greek, we can practice the plural you of shared church.